In a thematic issue of social indicators, Statistics Iceland presents for the first time a detailed overview of the social well-being of immigrants in Iceland. The percentage of immigrants of the Icelandic population has never been higher than in 2018 when it reached 12.6%. The results suggest that immigrants have good access to the Icelandic labour market, are generally members of a workers union and experience similar environmental quality and safety in their neighbourhoods as locals. However, immigrants face more barriers in their pursuit of education within the local education system, are less likely to get jobs that fit their qualifications, live more often in overcrowded dwellings, and have a partially worse financial situation than the local population. Immigrants are a diverse group of people who migrate in order to study, work, have family ties or are in search of international protection. The percentage of immigrants in Iceland is now similar to that of the other Nordic countries. There are, however various indications that suggest that the immigrant population in Iceland is different from immigrants of the other Nordic countries. For example, almost all second-generation immigrants in Iceland are under the age of 17, and they are proportionally fewer than in most of the other Nordic countries, which is indicative of the brief history of immigrants in Iceland. What characterizes immigrants in Iceland, among other things, is that most are men, are of working age, and have stayed in the country for a short time. Furthermore, the birth rate for immigrants is lower than for the local population. Most immigrants are born in countries where the state of health, education, and finances are similar to Iceland and are considered to be good in an international comparison. The results suggest that immigrants have good access to the Icelandic labour market. 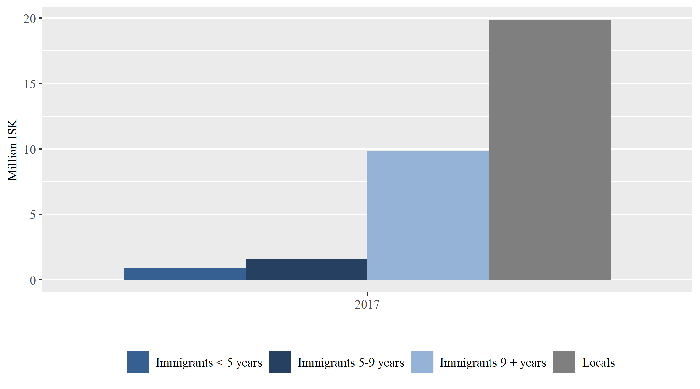 The figures from 2017 show a higher employment rate among immigrants compared with local inhabitants as 86-91% of immigrants were employed in 2017 compared with 79-81% of the locals (with 95% confidence). These results are similar to Israel, Hungary, and Luxembourg, where the employment rate is at least 7% higher among immigrants compared with locals. However, the results are different from Belgium, France, Denmark, the Netherlands and Sweden, where the employment rate is at least 10% lower among immigrants than among locals. The employment rate in Iceland is higher than the OECD average, for both immigrants and locals . Despite active participation in the labour market, immigrants are less likely than locals to have jobs that suit their qualification. Immigrants’ enrolment in primary, secondary and tertiary school is in general lower than the enrolment of locals. 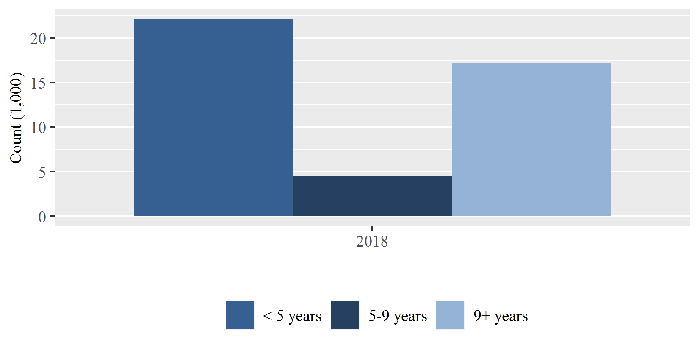 A relatively smaller group of immigrants start upper secondary school at the age of 16 and their enrolment decreases more with each year, compared with locals. Looking at 2017, the data show that almost all locals enrol in upper secondary school at the age of 16, but eight out of 10 immigrants. At the age of 19, about seven out of 10 locals enrolled in upper secondary school compared with only two out of 10 immigrants. 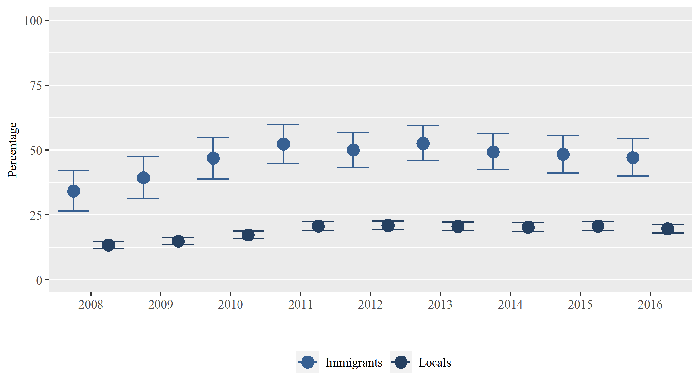 The repetition of this pattern between 2008 and 2017 may suggests that upper secondary dropout is more common among immigrants. The majority of those who attend upper secondary school have lived in Iceland over nine years. It is more common for immigrants to be on the rental market than for locals. Although immigrants are more often tenants, the burden of housing costs is not significantly different by background for most of the years that were examined. This might indicate that immigrants are more likely to adjust their housing size to meet expenses, since the results also show that a larger percentage of immigrants live in overcrowded housing. This changed in 2016 (the most recent figures available) when a significant difference was in the housing cost burden by background. That year, a larger percentage of immigrants had an excessive housing cost burden than locals. The results show that in 2017, the median of total annual income of immigrants was 4.9 million ISK but 5.2 million ISK for locals. This indicates that relatively fewer immigrants have a very high total income compared with locals. Immigrants’ average assets were less than locals, the difference being greater than the difference between the income of immigrants and locals. This difference is not surprising considering that a large percentage of immigrants have only stayed in Iceland for a short time. The median of assets by length of stay shows that immigrants who have lived in Iceland for a short time own assets worth less than those who have lived here for more than nine years. Nonetheless, the median of the assets for immigrants who have lived here longer than nine years is lower than the median of locals’ assets. In general, immigrants have a lower income of social benefits and less debt than locals. It is important to bear in mind when interpreting the results of the social indicators that immigrants and locals differ in more aspects than just their background. There may be a difference in the age or gender distribution between the groups. Furthermore, the social indicators do not reveal whether or not the well-being of immigrants has changed after migrating to the country. Finally, it is important to keep in mind that it is difficult to obtain as reliable information on immigrants as for locals. Immigrants not registered in Iceland, those staying in the country illegally or victims of human trafficking are neither in official registers nor in sample surveys. Immigrants are also less likely to respond to survey questionnaires. This is a general problem for official statistical, which is likely to cause more bias for immigrants.